If you’ve been following our blog recently, you’ll be aware that we’re showcasing the Linn DS range throughout the month of January. The Sneaky DS is the most affordable of all Linn’s DS players, but it’s by no means light on features or sound quality. In fact, it’s extremely flexible as its slimline design allows you to position it wherever you please, be it a bookshelf, a table, or inside a cupboard. Sneaky’s one of four digital music systems that form Linn’s DS range. The others include Akurate, Klimax, and Majik. All four deliver a first-class audio performance, and you can compare their features right here on the Rococo Systems website. Linn’s tagline for its Sneaky digital music players is “Simple styling – specialist performance” which sums this product up perfectly. It might be smaller in size than its siblings, but it’s been designed to impress your ears rather than your eyes. It’s also the only DS product that can be plugged into any external speakers using its Deltron speaker connections. However, if you want to enjoy the exceptional sound quality that comes as standard with Linn’s players, we recommend that you ask us about our range of Linn speakers. 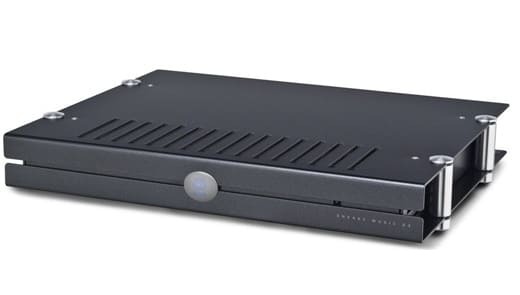 This slimline system is capable of streaming any digital source over a standard network, and can support almost every digital format you can think of up to 24-bit 192 kilohertz. In fact, Sneaky’s ready-to-go as soon as you are, as everything you need (including an onboard power amp) is built-in. So, all you need to do is decide which speakers you wish to pair it with. Don’t forget that this fantastic music system also comes with Linn’s Space Optimisation technology, which allows you to place it anywhere you like without having to suffer unwanted distortion from its surroundings. Did you know that Rococo Systems also offers you the chance to fast-track your way to a Linn DS system through our trade-in offer? Whether you wish to buy your first DS player or build a custom system using Linn hi-fi separates, we may be able to help you lower the cost. Our part-exchange team will consider all high-end stereo equipment, such as Roksan, Cyrus, Naim and, of course, Linn. The best way to talk to us about the possibility of a trade-in is to contact our Essex office on 01277 890 888 or our London office on 020 7454 1234. Our experts will be able to give you an estimated price, and once you’ve sent your equipment into us for a final valuation, we’ll then be able to give you the best possible market price, which can be offset against the cost of your new system. Call us now to book your personal demonstration of the Sneaky player today, and one of our Linn experts will demonstrate this very special system to its full ability in our dedicated Linn Suites in either Essex or London. They will also be able to talk you through the design options that are available. If you’d prefer, you can complete our online demo request form, and a Rococo Systems specialist will respond to you very shortly.